In psoriasis, environmental triggers skew T cell differentiation toward Th1 and Th17 subsets, which release proinflammatory cytokines that play a key role in this condition’s pathogenesis. Monoclonal antibodies targeting the cytokine cascade can improve psoriasis, but the root cause of pathogenic T cell imbalance remains unclear. A study led by Qianjin Lu and the Central South University in Hunan, China followed up on reports of miR-210 upregulation in psoriasis patients. The study, published last week in the JCI, shows that increased miR-210 expression enhances Th1 and Th17 differentiation and facilitates psoriasis-like inflammation. The researchers determined that miR-210 represses its targets, STAT6 and LYN, to bias the immune response toward pathogenic T cell subsets. Ablation or silencing of miR-210 protected against psoriasis development in a mouse model, suggesting a potential strategy for preventing T cell imbalances that contribute to psoriatic inflammation. 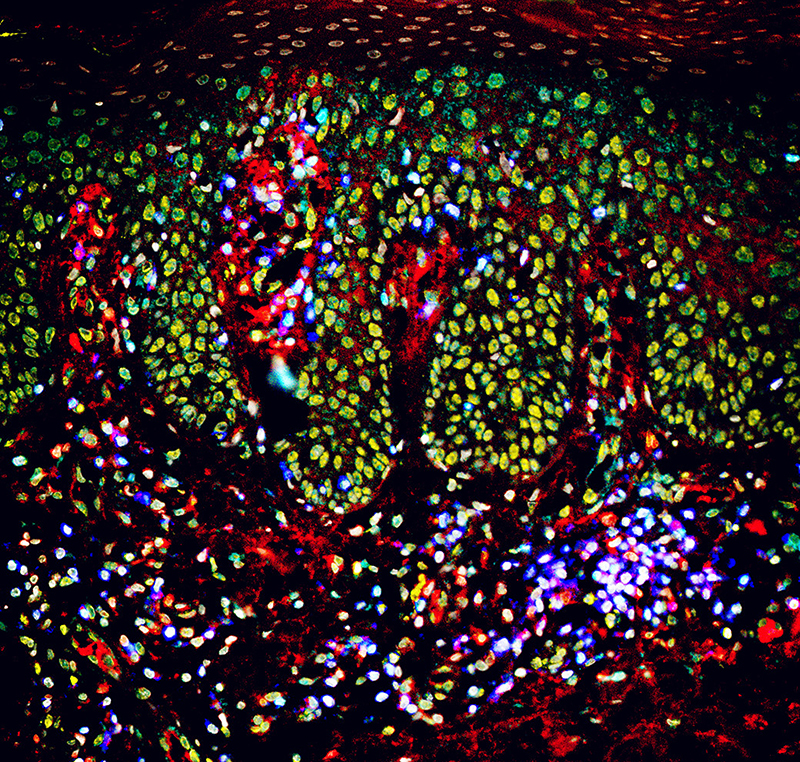 The highlighted image illustrates the imbalance between CD4+ T cell subsets (red) in a human psoriatic lesion, with numerous Th1 cells (co-stained for T-bet, yellow) and Th17 cells (co-stained for IL-17, blue) and few Tregs (co-stained for Foxp3, cyan). Nuclei are shown in white (DAPI). Image credit: Dr. Qianwen Li, Hunan Key Laboratory of Medical Epigenetics.